With Faneuil Hall opening in 1742, followed by Quincy Market in 1826, Boston's market district was born. 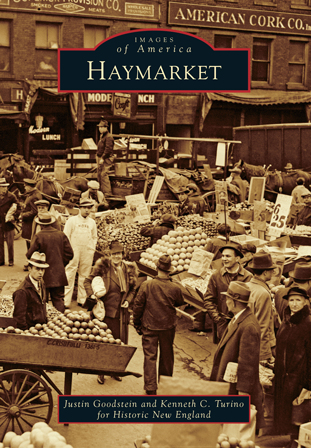 Haymarket began as an expansion of Quincy Market in the first half of the 19th century. Over the years, Haymarket has witnessed the Central Artery rise above it in the 1950s and retreat underground almost 60 years later with the completion of the Big Dig in 2007. These obstacles have not stopped the market from serving a constant stream of students and tourists, longtime residents, and newly arrived immigrant families. For most of the 20th century, the pushcarts of Italian produce vendors lined both sides of Blackstone Street. Today's market includes halal butchers, artisanal cheese mongers, and Cambodian fruit sellers. Haymarket is open Fridays and Saturdays from dawn to dusk at the intersections of Hanover, Blackstone, and North Streets and continues to host an ever-changing and diverse population. Justin Goodstein is a documentary photographer and the digital imaging production assistant for the Boston Public Library. Kenneth C. Turino is the manager of community engagement and exhibitions at Historic New England. The team drew on images from Historic New England's library and archives, as well as the Boston Public Library.